The land around Bullo River Station is spectacular, to say the least. And its inhabitants are equally remarkable. As part of our ongoing study into pygmy freshwater crocodiles (see previous post) we keep bumping into critters that seem even more intriguing. Every two to three days, Franz Ranacher drops us off with his Robinson R44 helicopter into the upstream escarpment country. Once the fading sound of rotor blades has left us behind, we're surrounding by the sounds of birds, chirruping insects and squeaking frogs. You really don't have to go very far to find something fascinating. Our surveys involve long walks during the day along the creeklines and isolated pools, returning at night to spotlight for crocodiles and hopefully catch a handful for tissue samples. So we get to see a lot of diurnal and nocturnal wildlife. Occasionally we find something that really takes our breath away. Apart from the crocodiles of course, which are always cause for excitement. 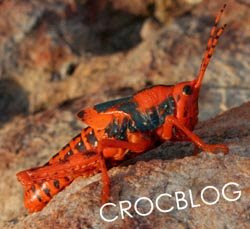 So if you'll excuse my slight devitation from the crocodile theme of this blog, here are a couple of really cool critters. You can call them honourary crocodiles if it makes you feel any better about it! The first is a Northern Knob-tailed Gecko (Nephrurus sheai). This little fellow was hot-footing it along beside our mozzie dome one night, looking more like a wind-up mechanical toy than a reptile. We managed to intercept him with the camera and took a few snaps. They really do have a tiny little, stunted-looking knobbly tail. I'm sure the first one to be found was suspected of having its tail bitten off when it was young... and then the second... and then they all seem to have these bizarre tails! They also have an enormous head, so much that they always seem to be in danger of pitching nose-first into the sand. 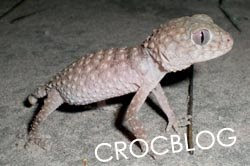 Their entire body is also covered with tiny, rosetted scales. With their huge eyes and disarmingly amused expression, they're not the kind of thing you forget easily. The second is a Leichardt's Grasshopper (Petasida ephippigera), which seem like they've come straight out of a children's toyshop. Some Aboriginal people call these "Children of the Lightning Man" and you can probably see why. As you can probably imagine, they taste pretty bad, which explains why they're pretty laid back when you find one. Not that we had any intentions of eating one to test the theory. These grasshoppers are also used as a sign of the oncoming wet season. Although it is still early September here, the humidity is starting to rise and the days and nights are getting progressively warmer. These kinds of triggers cause the adult form of the grasshoppers to emerge, where they are said to look for the lightning storms that signal the beginning of the wet season in November. Hey Adam, great blog. Glad to see the number of posts increasing in 2008. Sounds like you do very interesting work.